Saks Fifth Avenue Eyewear is a sophisticated collection of optical frames and sunglasses with classic style and beautiful details. As a leader in couture fashion, the Saks Fifth Avenue brand is adored by fashion and status-conscious buyers. 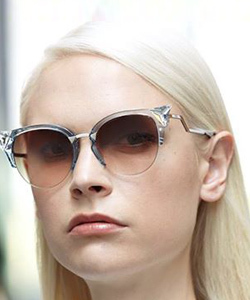 The eyewear collection upholds the Saks Fifth Avenue standards of elegant and stylish designs for the practical, fashion forward shopper. Saks Fifth Avenue frames are available in a variety of shapes and colors, suitable for a variety of face shapes and complexions. Adorned with intricate details, many styles feature ornate temple designs, embellished with stones, pearls and carvings. The Saks Fifth Avenue collection offers high quality and stylish frames for any occasion with full-rimmed and semi-rimmed styles, made from quality metal or acetate materials. Check out the Saks Fifth Avenue Eyewear website.